A few weeks ago my friend Caleb came down to test out my new game room and play his first game against Japanese in Chain of Command. Since he had a platoon of Perry Desert Rats that hadn’t seen the table in a while, the Malaya 1942 Campaign in the 2015 Christmas Special seemed like a good place to start. In addition to featuring an Australian platoon in tropical uniforms fighting Japanese, this campaign introduces an environment that was new to both of us: the jungles of Southeast Asia. So before we could game, some terrain work needed to be done! So what did all this stuff actually look like? Luckily for me, my wife is interested in, and very good at, making terrain, so we both scoured the internet for pictures of what jungles and buildings in Malaya looked like in this period and found quite a bit of good material. (Yes, I know just how incredibly lucky I am!) We agreed that for our first outing into the jungle, we should concentrate on the vegetation and leave the buildings for later. I then went looking for tree recommendations on TMP and the Lead Adventure forum followed by a search of ebay and Amazon for things to use for bamboo, palm trees and underbrush. We settled on a pack of 100 bamboo plants at 1:75 scale from Winomo, a pack of 12 rainforest palms at a variety of scales from Winomo and 2 packs of 15 coconut palms at a variety of scales from Nuolux for a start. In addition, we picked up some plastic bushes from Michael’s for general undergrowth and for secondary jungle. After basing and some dry brushing the trees, bamboo and underbrush started to look pretty good, especially when mixed in with deciduous trees that we had made for our Corinth board a couple of years ago. 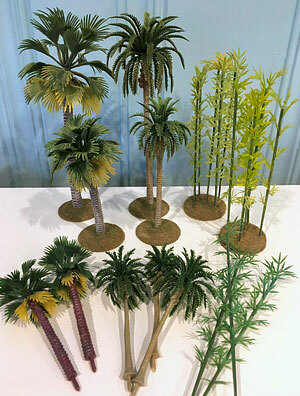 We also used all our old 15mm palm trees. At this scale they look like the palmetto bushes we saw in our reference photos. 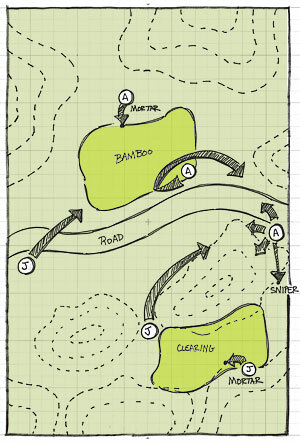 A 6′ x 4′ jungle board needs lots of trees to look right, but I think we ended up with pretty good coverage! We played the first game of the campaign, which was a patrol. Our random terrain ended up being wild bamboo and a clearing, so the new bamboo got used and I think it turned out pretty well. For support, Caleb (Australian) selected an adjutant, an extra SMG and a sniper, while I (Japanese) took an infantry gun. To add to the fun, we both rolled well on our force morale (11 for the the Japanese, 10 for the Australians) so we knew going in that it might be bloody. It being our first game in the jungle, mistakes were made. I pushed a Squad forward but had problems supporting it due to the line of sight in the Jungle. Caleb put a squad in the bamboo to help gang up on my forward squad, but it retreated after the first HE rounds hit. The sniper fired all day long with no effect. I moved units into SMG range without thinking about the consequences. In effect, we stumbled into some bloody sustained close range firefights and after both sides suffered pretty significant casualties (I lost 15 guys while Caleb lost 14!) the Australians withdrew to the next position in the campaign. So what did we learn about fighting in the jungle for our games going forward? So what did we learn about fighting in the jungle for our games going forward? Jungle makes firefights more survivable due to the hard cover and easier to avoid/end them due to range limitations. Light Mortars are hard to use. We played that you couldn’t fire Mortars indirectly from inside primary jungle due to the canopy, but could from other terrain types (Road, Bamboo, Clearing, etc) which both made those places valuable and made using the light Mortars more difficult. SMGs rock! Since most firefights are taking place at short range, the extra dice from SMGs make a difference. Bamboo is a death trap if there are any HE weapons involved. Snipers are harder to use due to range limitations. The game felt quite different from the European based games that have been most of what each of us has played and presented some unique challenges. The next game in the campaign is a probe and may involve some armor, so we’ll see what lessons learned that adds to the list. I’m really looking forward to some more games in the jungles of Malaya! Thanks for taking the time to comment! The fighting in the jungle has been interesting so far and it has helped me understand why organizations developed like they did in the Pacific. We just finished the second game of the campaign over the weekend, so I hope to get that written up as a post soon!